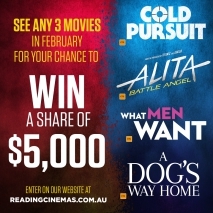 Competition See any 3 MOVIES IN FEBRUARY for the chance to WIN A SHARE OF $5000 CASH! See any 3 MOVIES IN FEBRUARY for the chance to WIN A SHARE OF $5000 CASH! See any 3 movies in February and you could WIN a share of $5000 CASH! With some huge releases such as ESCAPE ROOM, COLD PURSUIT, HAPPY DEATH DAY 2U, ALITA: BATTLE ANGEL, WHAT MEN WANT and many more, there is something for everyone this February at Reading Cinemas! *HOLD ONTO YOUR TICKETS AS PROOF OF PURCHASE IN CASE YOU ARE THE WINNER! 5 x $1000 cash prizes to be won. What was the best film you saw at Reading Cinemas in February and why?